Bonus: Tier 1. 1ETH = 4970NEWS 42% Bonus Tier 2. 1ETH = 4095NEWS 17% Bonus Tier3. 1ETH = 3500NEWS 0% Bonus All Tiers are open for Public. The Reporter Community Kft. (Ltd) developed a mobile application (Reporter App) and an e-marketplace for UGC uploaded and created via the App. Only verified, digitally watermarked content (by the App) can be uploaded to the marketplace, where our partners can find them using our intelligent search and indexing method and buy them with a single click. Uploaders once finished their registration, can publish their content adding a short caption and some tags and the demanded price. Reporter Community wants to offer a 100% secure, reliable UGC to news agencies and to media players. 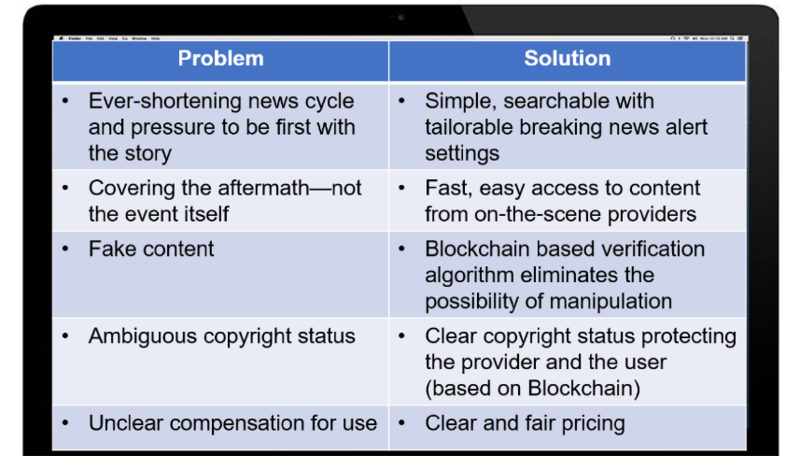 With the operating MVP version of the Reporter App, the company offers authenticated phone sensor data verification which filters out 90% of false news. Enhanced authentication process where the content’s proof of existence is also stored on the public Ethereum blockchain to verify any further future copies for authenticity. 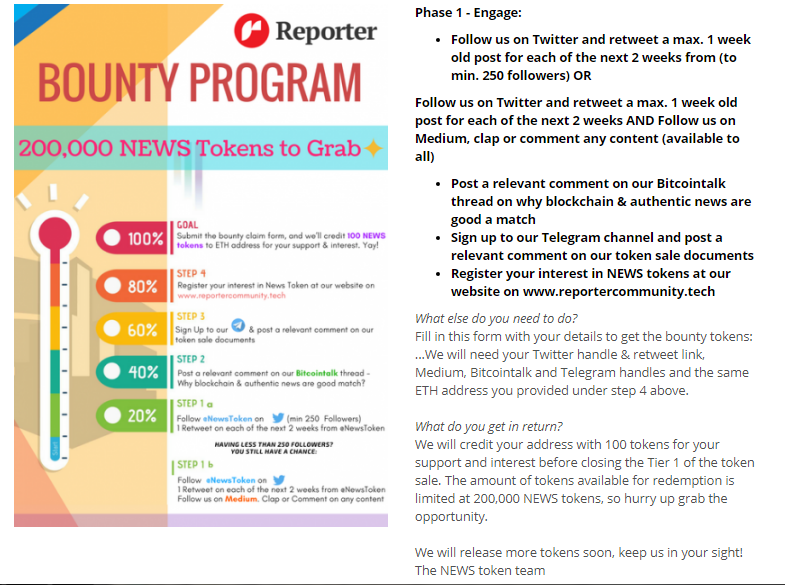 Reporter Community is the first market player to integrate blockchain technology into UGC which offers a 100% verified authentication process to all market players. None of the new media market players recognized the benefits of blockchain technology till the middle of 2017. 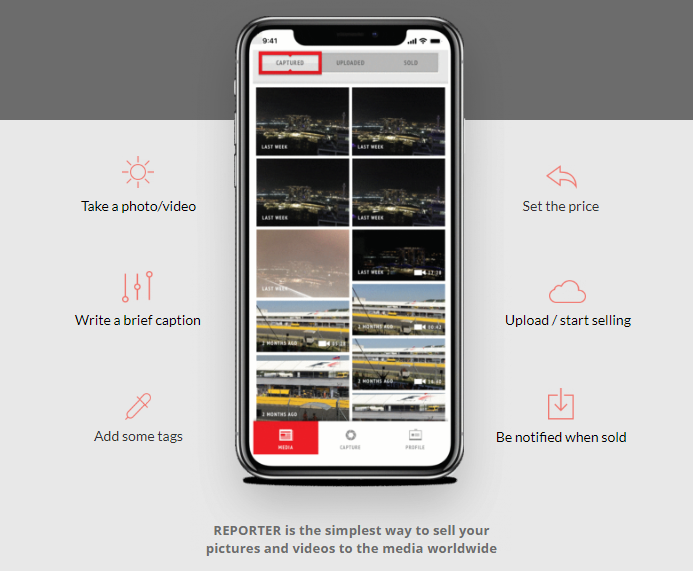 Reporter Community is the first market player to integrate blockchain technology into UGC and to deliver reliable content to media and news agencies. Reporter app launched on IOS & Android 06-12-2016 The apps are available from the AppStore and Google Play.